RARE OPPORTUNITY to build custom dream home on special double lot! On the most desirable block in Bucktown. Only double lot left on the tree-lined Winchester St. South facing allowing sunlight all day! Architectural plans by award winning Blender Architecture included. A vacant bungalow sits on 1 lot and the other is vacant. City demo permits in hand. Water shut off. 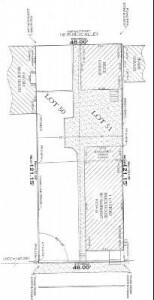 Build your dream home near the heart of Bucktown!